Most of us know a dietary disaster when we see it on the menu: a double bacon cheeseburger or a slice of cheesecake. But we often don't realize there are a host of unhealthy foods we eat everyday, right in our refrigerators. These foods can add extra calories, fat, sugar, and salt to your diet without you realizing. 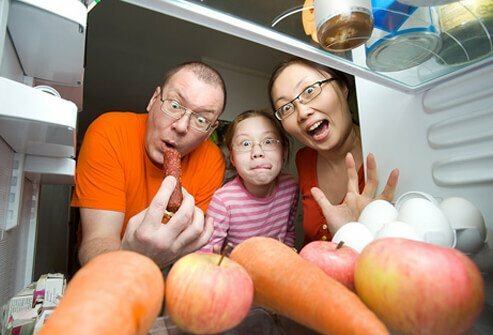 We will review the 10 worst foods you may have in your refrigerator or freezer. Foods on this list are commonplace, high in trans fats, saturated fat, sugar, and/or salt. We will also take look at healthy alternatives suggested by WebMD nutrition expert/writer Elaine Magee. Mayonnaise in itself might not be the worst food, if you only use a teaspoon or two. But most of us slather on this creamy, savory condiment that can set you back a whopping 360 calories, and 40 grams of fat in a ¼ cup serving. Fortunately there are several healthier options that offer a lot of flavor without all the fat. 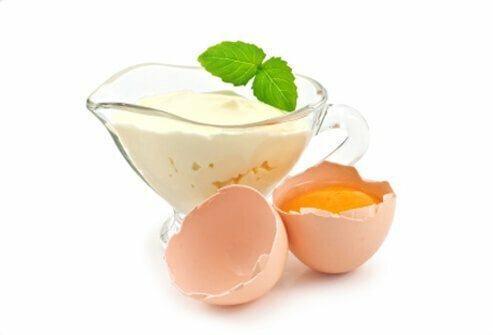 Use light mayonnaise – at just 35 calories and 3.5 grams of fat per tablespoon this will cut calories and fat while keeping the mayo taste you enjoy. Consider alternative condiments such as mustard, BBQ sauce, salsa, chili sauce, or taco sauce. If you must use the "real thing," then cut your portion back to just 2 teaspoons, which are 60 calories and 6.7 grams of fat. One of the main contributors of "empty calories" are sugary drinks: soda, sweetened tea, fruit drinks, and sports and energy drinks. 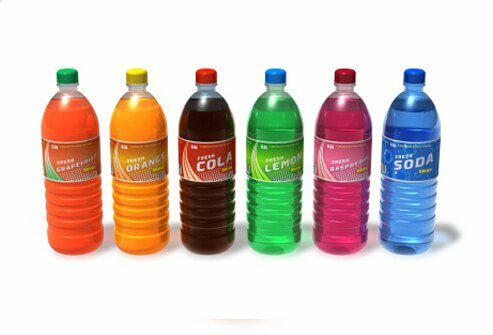 These beverages are all calories from sugar, usually with little to no nutrition otherwise. Research has also shown that we don't eat less when we drink these sweetened drinks – we eat just as much, adding the extra calories in our drinks. The best beverage is good old-fashioned water. This should be the main source of hydration in your day. Some calorie-free drinks such as unsweetened green and black teas are also good sources of healthy antioxidants. Skim milk and plant-based milks such as almond or coconut milks have some calories, but they also are good sources of several nutrients such as calcium, vitamin D, B-12, potassium, and magnesium. Alcohol is often abused and the effects of excessive consumption are well known, but it can also be a diet buster. 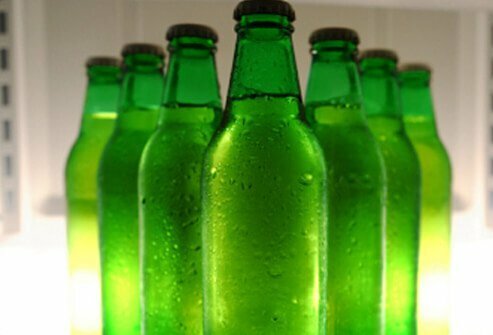 Your liver has to work hard to break down the alcohol into fatty acids, which then accumulate in the liver. Even one night of heavy drinking can cause fat to accumulate in the liver. Alcohol, like soda and other sugary drinks, is empty calories. One glass of wine (8 ounces) has 170 calories, a bottle of beer (12 ounces) contains 150 calories, and a 1-½ ounce shot of liquor (vodka, rum, gin, whiskey) is about 105 calories, which may be in addition to soda or mixers you add to the shot. With alcohol, moderation is key. The best bet is to drink alternatives to alcohol such as mineral or soda water with a lemon or lime wedge, coffee or tea, or diet sodas. 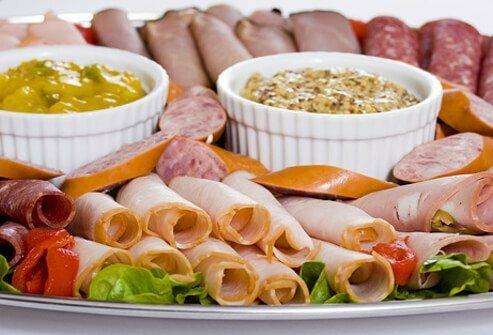 Lunch meats including deli cold cuts, bologna, and ham may seem like wholesome and healthy foods but they contain loads of sodium, can be high in fat, and some have preservatives such as nitrates. The sodium in just on small serving of lunch meat (one slice of bologna or five slices of salami) ranges from 310 to 480 milligrams. Diets high in sodium may increase the risk of high blood pressure, a leading cause of heart disease and stroke. Processed meat (any meat preserved by smoking, curing, or salting with the addition of chemical preservatives) can lead to an increased risk for colon cancer, according to the American Institute for Cancer Research. Some researchers believe the preservatives used in processed meats may change into cancer-causing agents in the body. Alternatives to processed lunch meats include freshly roasted and sliced turkey, chicken, or roast beef. They contain all the protein, vitamins, and minerals, but none of the added sodium or preservatives. You can roast your own meat, or find deli brands with low nitrates and sodium. Hot dogs and sausage are other processed meats, full of sodium and fat. According to the Centers for Disease Control (CDC), Americans eat more than double the recommended amount of sodium, and frankfurters and sausages contain 520-680 milligrams per 2-ounce serving, along with up to 23 grams of total fat - 7 grams of saturated fat – per serving. Instead of hot dogs and sausage, healthier choices include lower-fat and lower sodium meats such as poultry, pork tenderloin, roast beef, and shrimp. Try grilled vegetables such as portabella mushrooms, eggplant, or roasted red peppers for a tasty and fat-free savory alternative to hot dogs or sausages in recipes. 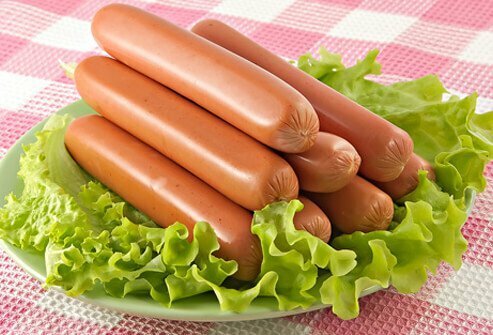 If you absolutely must have hot dogs or sausages look for "light" versions of your favorite frank, or turkey kielbasa, and even vegetarian soy-based meat substitutes. In some cases the sodium may be similar but the fat content may be cut in half. 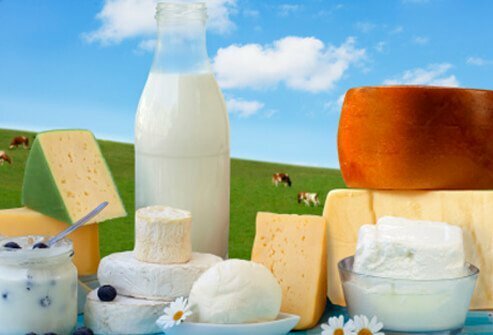 Whole milk dairy products contain lots of fat and cholesterol. Though they are not technically empty calories because they contain protein, calcium, B-12, and riboflavin, the calorie count really adds up. Just 16 ounces (2 cups) of whole milk a day would add up to 1,904 calories, 105 grams total fat, 59.5 grams saturated fat, and 315 milligrams of cholesterol in just one week. Fortunately, low-fat and fat-free options are available for most dairy products including milk, cheese, yogurt, cottage cheese, or cream cheese. In addition, many plant-based milks such as almond milk are low in fat and calories, and cholesterol-free. Let's face it – Ben & Jerry's and Häagen-Dazs make some tasty ice cream! Unfortunately, it comes with a hefty price to your diet. Even if you stick with the ½-cup suggested serving size on the pint, you can exceed recommended daily totals for saturated fat, total fat, and calories. One ½-cup serving of Ben & Jerry's Chocolate Chip Cookie Dough ice cream contains 260 calories, 14 grams fat, 9 grams saturated fat, 65 milligrams cholesterol, and 23 grams sugar. Just ½-cup of Häagen-Dazs White Chocolate Raspberry Truffle is 290 calories, 16 grams fat, 9 grams saturated fat, 90 milligrams cholesterol, and 27 grams sugar. Most of us typically eat twice the listed serving size, doubling the fat, calories, cholesterol, and sugar we consume. The good news is you don't have to give up ice cream completely. 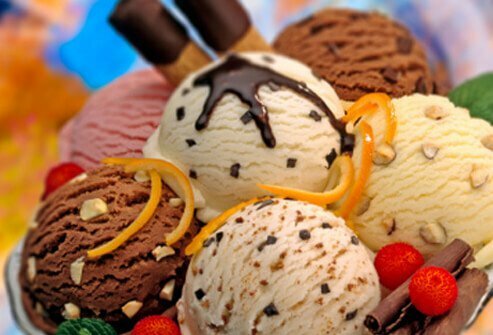 Look for great-tasting, low fat, low sugar – and thus lower calorie – ice cream. The light version of Safeway brand Mint Chocolate Chip, for example, is only 120 calories, 4.5 grams fat, 3.5 grams saturated fat, and 14 grams sugar for a ½-cup serving. An even healthier alternative is fresh fruit with plain yogurt. We try to eat well and salads are a great place to start. But if your refrigerator contains bottles of creamy ranch, Thousand Island, or blue cheese dressing, you may be adding a lot of additional calories, fat, and sodium. A 2-tablespoon serving a creamy dressing adds about 120 calories, 12 grams of fat, 2.5 grams saturated fat, and 380 milligrams of sodium to your salad. Most of us don't stop at that 2-tablespoon serving size and heap on double the amount - up to ¼-cup of dressing. 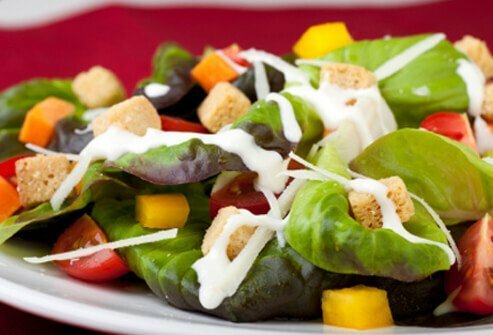 Measure your salad dressing and stick to the 2-tablespoon serving size. Also look for light versions of some of these creamy favorites that have fewer calories and fat. You may also enjoy other lighter dressings that don't have the heavy cream, such as Newman's Own Low Fat Sesame Ginger or Ken's Lite Raspberry Walnut Vinaigrette. Margarine or butter in stick form is probably high in saturated fat – that's what makes it hold its form. You may also use more of the stick of butter or margarine because its firm texture makes it more difficult to spread on foods. Each tablespoon of either spread will give you 100 calories and 11 grams of fat. 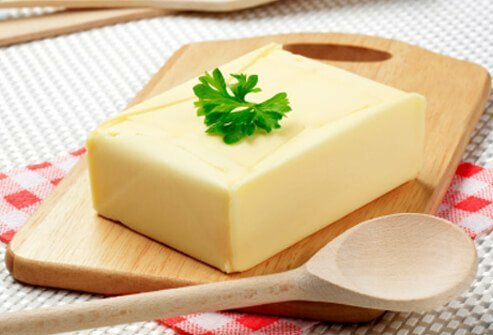 A tablespoon of butter also contains 7 grams of saturated fat, while a tablespoon of margarine has 2 grams of saturated fat and 1.5 grams of trans fats. Instead of cooking with stick butter or margarine, use canola oil or olive oil, which are "smart" fats – those rich in mono- and polyunsaturated fat. If you want to spread your margarine on foods, look for reduced-fat margarines that have no trans fat and low saturated fat. If you must have butter, use whipped butter. All that air makes it easier to spread, and cuts calories, fat, and saturated fat by a third. Potatoes by themselves are fat free and healthy. When you fry them up and make hash browns, French fries, and tater tots, these potato products become unhealthy. There are many frozen version that are ready-to-bake but just one small serving (3 ounces) can contain 8 to 11 grams total fat, about 3 grams saturated fat, 390 to 540 milligrams sodium, and 190 calories. Because these foods are tasty, many of us eat double this serving. The best alternative is to eat unprocessed potatoes. Bake or roast them, so you get all the nutrition without added fat, saturated fat, or sodium. You may also find some brands of frozen hash browns that have no added fat – read the labels. If you love fries, read the labels as well. 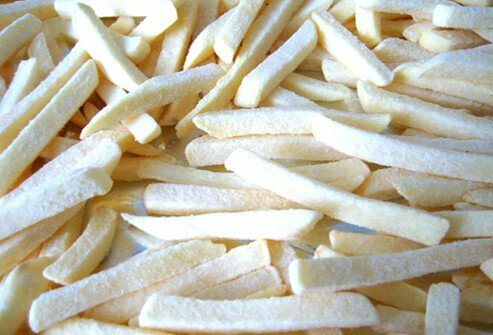 Steak fries are usually the lowest-fat option. American Institute for Cancer Research: "FAQ: Processed Meat and Cancer." Centers for Disease Control and Prevention (CDC): "Americans Consume Too Much Salt." Whitney, Eleanor N. and Rolfes, Sharon R., Understanding Nutrition, Sixth Edition, West Publishing Co., 1993.